A growing amount of research is sending a clear message to Americans: Added sugar is killing you. For many people, it’s a tough pill to swallow. Added sugar is seemingly everywhere in the modern American diet. The American Heart Association recommends that women consume less than 100 calories of added sugar per day (about 24 grams) and men less than 150 calories per day (about 36 grams). The average American overshoots those targets by a mile, consuming about 88 grams (equivalent to 22 teaspoons) per day. Diets high in added sugar have been linked to obesity, Type 2 diabetes, heart disease, tooth decay and even cancer. With sugar going out of style fast, many are scrambling to find a suitable substitute. Many artificial sweeteners technically have zero calories, but they can wreak havoc on your appetite control and quickly become addictive. Thus, natural alternatives might be the better option. Yacon syrup is a low-calorie substitute that’s become associated with a number of positive health benefits, such as weight loss and increased mineral absorption. A sweet sugar substitute that’s actually good for you? If you’re skeptical, we don’t blame you. However, yacon syrup has an intriguing amount of research backing it up. Here’s why you should consider adding yacon syrup to your diet. Native to the Andes mountains of South America, the yacon plant is a close relative of the sunflower. Its tuberous roots are a popular food in the region, often referred to as “Peruvian ground apples.” From the outside, the yacon root looks like a sweet potato or yam, but its taste is considerably sweeter. Though yacon root is a nutritious food in its own right, it’s often used to create syrup, produced by boiling the peeled root and concentrating it until it distills to a thick, dark consistency. Why Are People Excited About Yacon Syrup? Let’s start by looking at the basic nutritional facts for yacon syrup. One tablespoon contains 20 calories, 7 grams of sugar and 11 grams of carbohydrates. In comparison, a tablespoon of table sugar contains 48 calories, 12.6 grams of sugar and 12.6 grams of carbohydrates, so yacon syrup has a clear nutritional edge. It also compares favorably to other popular types of syrup. For example, a tablespoon of corn syrup contains 57 calories, 16 grams of sugar and 16 grams of carbohydrate; and a tablespoon of maple syrup contains 52 calories, 14 grams of sugar and 13 grams of carbohydrate. In terms of pure nutrition facts, yacon syrup is lower in both calories and sugar than table sugar and many popular sugar substitutes. However, the most impressive characteristics of yacon syrup are the supposed health benefits conferred by consuming it. Many so-called “super foods” are hyped up as nutritional panaceas, but rarely do they have the research to back them up. While more research still needs to be done regarding yacon syrup’s impact on human health, early results have been incredibly encouraging. A 2009 study entitled “Yacon Syrup: Beneficial Effects on Obesity and Insulin Resistance in Humans” examined the effects of a twice-daily dose of yacon syrup on obese pre-menopausal women over a 120-day period. At the end of the study, daily intake of yacon syrup produced “a significant decrease in body weight, waist circumference and body mass index.” In addition, participants experienced an increase in defecation frequency and improved satiety levels. According to Examine.com, an independent site that collates scientific research and disseminates information on supplementation and nutrition, rodent studies have found that yacon syrup leads to an increase in good gut bacteria and enhanced mineral absorption. So this sugar substitute could potentially have a positive impact on weight loss, body composition, appetite control, gut health and mineral absorption. 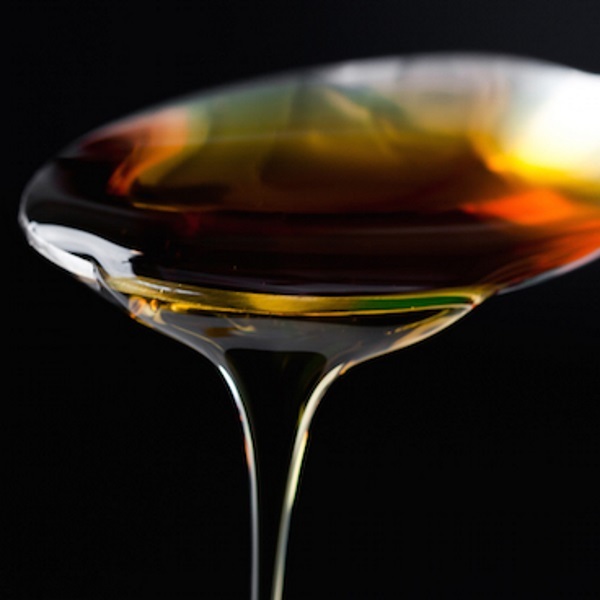 How the heck does a simple syrup have such health superpowers? The answers lies in fructooligosaccharides. What The Heck Are Fructooligosaccharides? Fructooligosaccharides (or simply “FOS”) are short- and medium-chain sugar molecules that the body cannot fully digest. They move into the large intestine and help stimulate the production of microbiota in the colon and gastrointestinal tract. More bacteria in your gut might sound undesirable, but researchers are finding that a diverse gut microbiome plays a crucial role in overall health. The human gut contains yeasts, fungi and roughly 3 to 4 pounds of bacteria. Generally speaking, the more diverse this bacteria, the better. Lean, healthy people have more diverse bacteria in their guts than obese, unhealthy people; and the average American gut is less diverse than those of people in other countries with healthier populations. Thus far, studies have connected the gut microbiome to autism, diabetes, obesity, cancer, IBS, arthritis, Parkinson’s disease, allergies, inflammation, acne and more. Since FOS cannot be fully digested by the body, yacon syrup ranks low on the glycemic index. Low GI foods help control blood sugar and prevent crashes, which ultimately can reduce the risk of obesity, high blood pressure and Type 2 diabetes. As such, yacon syrup has become a popular sweetener for many people who have diabetes. There’s still research to be done, but yacon syrup’s high FOS content is likely the driving force behind its impressive health benefits. Yacon syrup has a rich taste similar to raisins. It’s not quite as sweet as table sugar ounce for ounce, but it definitely adds sweetness to dishes like oatmeal, smoothies, pancakes and desserts. Large doses of yacon syrup have been found to lead to abdominal discomfort in some people, so it’s wise to start off slowly if you want to introduce it into your diet. Begin with a teaspoon per day and work your way up from there. It’s also important to remember that yacon syrup contains a high amount of simple sugar, so it’s best used in moderation. Instead of throwing it on everything, simply use it in place of the sugar or sugar substitutes that already exist in your diet.